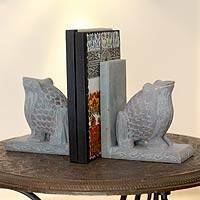 Welcome to NOVICA’s Bookends collection! What better way to safeguard all your favorite printed words than with these creative and unique bookends? Whether your book collection is large or small, fantasy, fiction, or history, these handcrafted pieces add a whimsical touch to any shelf. Fantastic wood working skills in this set! It has the details on the front and the back, and the wood is the same beautiful color as the photo. I am grateful to be able to buy something this wonderful via NOVICA. 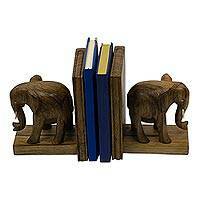 These Elephant bookends surpassed my expectations. I love, love, love them. What a wonderful talented artist Francis Agbete is. Will definitely buy from him again. My wife bought these for my birthday and I just love the artistry. The soapstone material is unique, the carving beautiful, and the weight is perfect for holding books. This is the kind of possession you pass on to your children. The artist is motivated to carve by one principal theme: "Recording the events" of his time. George Obeng was born on March 30, 1952. His carvings are realized primarily in ebony wood, as the material is endowed with innate strength and beauty that requires no chemical enhancement. Mahogany, odum (oak), sese, and odanta are other woods he employs, although these need to be treated for preservation. Obeng prefers to leave his ebony carvings unpolished, he says, "Because the beauty and natural sheen of the wood in nature is left on perpetual display." The artist is motivated to carve by one principal theme: "Recording the events" of his time. As an animal rights activist and a committed vegetarian, wildlife plays an integral role in his work, such as the tenderness of the butterfly, the mischief of the monkey, the slowness of the snail, and the vivacious character of the bird. Each of his carvings is a poignant reminder of this critical juncture in the preservation of the global environment and communal ecology. Themes of the "Third World" also inspire Obeng's art. Depictions of female figures, often carrying children and heavy baskets simultaneously; comments on the cyclical problem of social confusion and irresolution, which extend into the endemic nature of inadequate and/or nonexistent development of facilities like health care, education, food, security. He is an observer of his time, struggling to represent the myriad unheard voices that surround him. 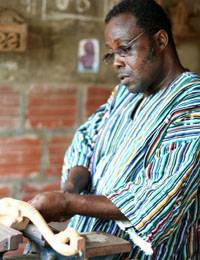 But for his stalwart determination, Obeng would not be the carver he is today. He had been ordered by an elder relative to take up typesetting and printing, and from 1967 to 1970 he was apprenticed to a master printer, having completed Middle School Education with a certificate in 1967. However, he defied his family and undertook part time studies in sculpture from 1970 to 71. Between 1972 and 1974 he took a course in sculpture at the School of Art and then a proficiency course in sculpture at the university College of Art. He worked as Assistant Cultural Officer with the Arts Council of Ghana while practicing painting between 1971 and 1986. Obeng was responsible for exhibitions, restorations, commission, and training workshops for carvers. As an apprentice for Saka Acquaye, a renowned sculptor, he was able to participate in exhibitions in Ghana, Oakland, Britain, Bulgaria, Romania, and China, along with many other African countries. Since 1986, Obeng runs a workshop where he constantly trains apprentices; he also offers assistance to carvers. His works are displayed in the Official Residence of the Ghana High Commissioner to Nigeria; in Barclays Bank, Ghana Ltd., Africa Films Ltd., and the Arts Council of Ghana, Accra. His awards include second and third prizes in Sculpture, National Arts Contest 1979 and Sculptor of the Year from Leisure Arts and Entertainment, 1988. He is currently married to his sweetheart with whom he has four wonderful children. 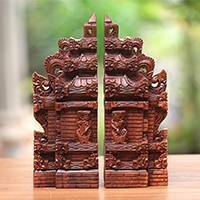 Hand-Carved Cultural Suar Wood Bookends from Bali (12 in. ), "Gapura Gaze"
Aluminum bookends (Pair), "Handstand Harlequin"
Hand Carved Wood Bookends from Africa (Pair), "Good Luck Elephant"
"In Ghana, an elephant raising its trunk is a sign of good luck," Francis Agbete says. 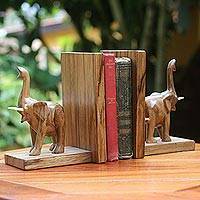 Working in richly grained ofram wood, he crafts a pair of bookends depicting the cheerful pachyderms. 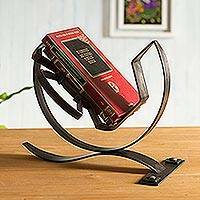 Unique Steel Book Stand - Metal Shelf Accent , "Inca Wisdom"
Some are made of cedar, others of ebony, and still others of bronze and marble. 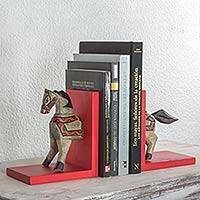 With NOVICA’s collection of handcrafted bookends, all your favorite titles can be on beautiful display. Our bookends come from such varied locations as West Africa, Brazil, Peru, and Bali and Java. And as diverse as the places from which they originate, our bookends come in so many different styles. Kwaku Ofosuhene Apenteng carves gorgeous antelopes grazing on the savannah and Luitpol Ruiz Gaviria erects aluminum harlequins balancing on their heads. Stacked between these unique pieces, even your books become art installations. 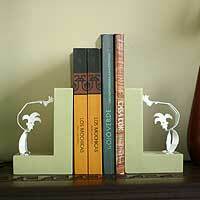 If you love to read as much as we do, we invite to enjoy our original bookends.